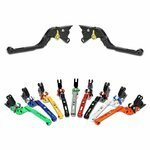 Motorcycle Levers - It's Your Ride; Customize! Motorcycle levers are a matter of personal style and can be completely customized to fit your riding style and the colour of your motorbike. Apart from being one of the strongest brake & clutch sets available online, V-Trec motorbike levers are designed to fit perfectly on your motorbike and come in a range of colours that suit your style. With a 100% guarantee, and fast delivery from Germany through the onlineshop, V-Trec brake and clutch lever levers deliver on performance safety and precision engineering. Adjustable according to your ride and personal specifications, these motorbike levers have been designed to fit all makes and models and to provide the most comfort for each rider. Every product sold through our online shop comes with a 30 days money back guarantee. Why? Because we're completely certain that all our products are flawless. The V-Trec brake and clutch levers have been extensively tested: Each set of levers have been approved by the world renowned Technical Inspection Association of Germany (Technischer Überwachungs-Verein or TUV) and that means a complete guarantee on safety and performance. Made from top grade aluminium each brake & clutch lever set is easy to install, comes with well-written instructions and is available for all makes and models of motorcycle from the onlineshop. 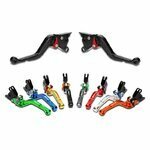 Every rider has a unique style and preference when it comes to motorbike levers, which is why V-Trec motorcycle levers have been designed to be completely adjustable according to your needs. Designed to be a perfect fit for different hand-sizes whether you prefer the short levers to be able to brake with two fingers or the longer levers to fit the whole hand. 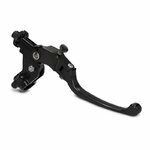 V-Trec motorbike levers can also be combined and are even adjustable while on the road. Aftermarket motorcycle levers add a unique look to any motorbike and with excellent design and stringent safety features, V-Trec brake and clutch levers make a great addition to the custom look of any bike. With free shipping from 69,90 GBP, V-Trec brake and clutch levers also make a great present for the motorbike enthusiast.